On this wiki, "Physical Pinball Table" refers to a Pinball game that originally existed as a tangible machine in its history. Many of these pinballs may be emulated or adapted for Video Game Systems or home computers, but their origins are in cabinets that can be touched, nudged, slapped, and jostled. Despite popular misconception, the rise of Video Games has not stopped pinball machines from being made. Stern Pinball continues to release a half-dozen new titles every year in several different editions, with a majority of them going to private owners over commercial establishments. New companies like Jersey Jack Pinball, Heighway Pinball, and Multimorphic are releasing new tables with original ideas for gameplay, modularity, and maintainability. Meanwhile, individuals like John Popadiuk and Ben Heck continue to make original machines with very limited production runs for truly devoted players, while companies like VirtuaPin and Pinball Controllers sell cabinets, hardware, and control boards to let hobbyists build their own tables. 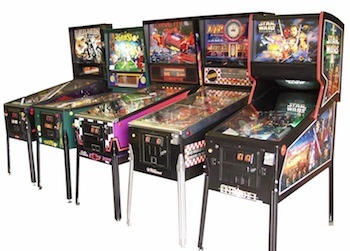 FarSight Studios' Pinball Hall of Fame series (with The Gottlieb Collection and The Williams Collection), and its successor series, The Pinball Arcade. Visual Pinball is a freeware computer application that works with a pinball ROM emulator (Visual PinMAME) to play recreated and original 3D-rendered pinball tables, similar to Microsoft Pinball Arcade. Future Pinball is another freeware computer application, using a fully-modeled, real-time 3D engine. Has not been updated since late 2010. Also see Digital Pinball Tables and Licensed Pinball Tables. Bill Paxon Pinball : a custom-made table by Video Game console modder Benjamin Heckendorn, featuring the grizzled actor and director. Predator: The first table from boutique manufacturer Skit-B Pinball, based on the 1987 movie of the same name. It's become infamous due to allegations of fraud and deception from the company, which has become subject of a pending litigation from customers. The game is unlikely to ever be released, given that it was never officially licensed by Fox. Experts of Dangerous: Skit-B's planned second game, starring Adam Savage and Jamie Hyneman from Mythbusters, which was cancelled due to the aforementioned Predator fiasco. The Pinball Circus by Python Anghelo for Williams Electronics, a pinball machine built to fit in a videogame arcade cabinet. note This was not the first pinball of its kind; Varkon tried a similar idea in 1982.